Mass Effect: Andromeda brings back cooperative multiplayer, but some aspects of it have changed. That includes the way it relates to the single-player campaign, though there is still a connection between the two modes. Unfortunately, BioWare is still playing coy about precisely how the two are connected. It did share with Game Informer that they are related; for instance, one of the currencies you earn in multiplayer, mission funds, has "tendrils going out into the rest of the game." The goal is to avoid forcing those who want a purely single-player experience to venture into multiplayer, as some felt was the case in Mass Effect 3. That said, doing so may lead to a more hands-on experience, as producer Fabrice Condominas said, "You will have possibilities to send teams to complete kind of side missions, or to do it yourself in multiplayer." As for how multiplayer itself plays, you can expect to be on the move more often than in Mass Effect 3. Whereas that game often saw players often stay in a fixed location they could defend, Andromeda will throw new enemy types at you that force you into or out of cover. Combined with jetpacks, mobility will be key. "The first thing everyone will notice is how dynamic it is," Condominas told Game Informer. "Everything is more fluid, fast-paced, there's a lot of action going on. The controls are also more responsive. All of that is on purpose; we really wanted to increase the dynamism and how accessible it is while retaining the depth and going more into layers." Other details of note include abilities having their own, independent cooldowns (as opposed to one shared one) and the return of card packs. These can be purchased with real-world money or currency earned by playing and will include random assortments of weapons, items, and characters. Alternatively, there will be a store with a rotating lineup of these things for purchase, again with real money or a different in-game currency (the aforementioned mission funds). The store provides you with an opportunity to know exactly what you're getting, unlike the blind card packs. 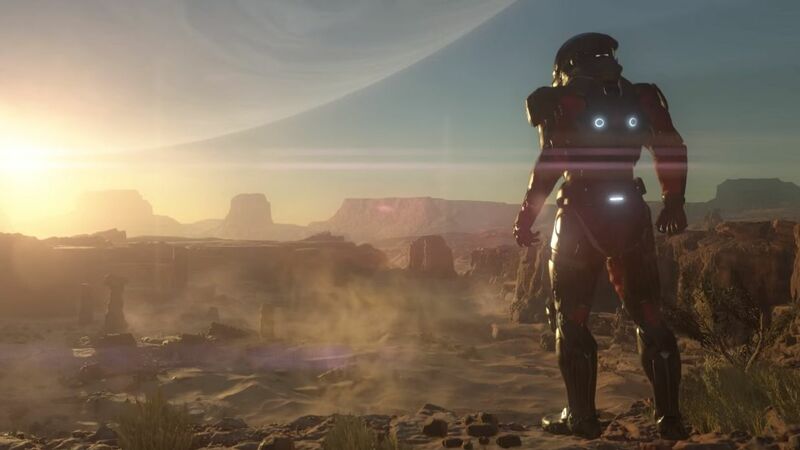 Gameplay footage from Andromeda is just days away, as BioWare plans to show it off during The Game Awards on December 1. The game itself--which BioWare says is its biggest ever--is due out sometime early next year.